Okno v Parizh is a hilarious 1994 comedy about Nikolai, a St. Petersburg music teacher, and his friends who discover a “window to Paris” in a communal apartment. I was as shocked as Nikolai must have been this week when I stumbled through a door on Malaya Bronaya. I found a closely packed, noisy bistro filled with fulsome aromas from an open kitchen directly in front of me. It’s difficult to be modest about Uilliam’s: it practically screams best restaurant in town. One wants to be cautious, after all it just opened in July, so we’ll give it time. But, after six years of writing PASSPORT restaurant reviews, Uilliam’s is the first place with that genuine comfy feeling of a popular neighborhood Parisian bistro. Uilliam’s is small, squeezing in at most 60 diners. Décor is simple. It’s practically impossible to get a seat. The tables wrap around a busy, completely open kitchen that is dominated by a huge bright red and brass French artisan Molteni range marked with a large brass plate “Specially for Uilliam Lamberti”. Molteni calls each of its custom stoves “a unique jewel” for great chefs, and Lamberti must be proud to have his Molteni in Moscow. Owner-chef Uilliam Lamberti is a fifteen-year Moscow veteran from Ascona. Early on he was chef at El Dorado. Most recently he has been a consultant with Ginza Group, the St. Petersburg restaurant conglomerate that has dominated Moscow’s new restaurant scene for the past two years. 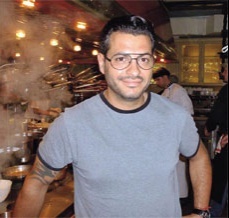 However, we understand that Uilliam’s is Lamberti’s own pride and joy, and as chef-owner he is a rarity in Moscow. The cuisine is creative European; there was even Russian Okroshka soup on the menu (but with scallops and marinated salmon). Uilliam’s simple one-page paper menu changes monthly. The plain listings (Seafood Salad, Chicken Soup, Ravioli or Salmon) belie the complexity of the preparation and presentation. For instance, the Seafood Salad (800r) was a wonderful helping of octopus, squid and prawns laid over a thick slice of baked eggplant. 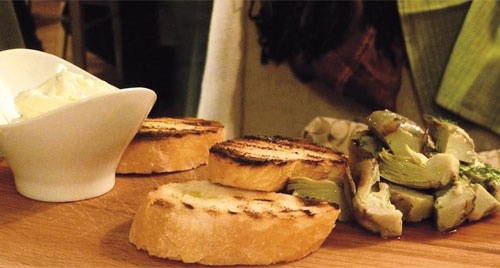 The Artichoke (500r) consisted of a generous stack of artichoke heart served on a wooden chopping board with thick, toasted slices of baguette and a delicious whipped goat cheese. The main course Salmon (500r) came out with chanterelle mushrooms under a delightful spinach creamy sauce, and the Ravioli (550r) was made with duck, foie-gras, spinach and goat cheese. Uilliams’ has a short selection of Rotisserie items – Duck (700r), Rabbit (550r), Quail (450r), and Grill – Ribeye Prime (950r), Lamb Chop (900r). I started with the Seafood Salad followed by a Ricotta Cheese Soup (600), a remarkable cheesy yet thin soup with chanterelles served in a small copper cooking pan with long crispy slices of baguette. I finished with a Rigatoni with Neapolitan meat sauce (700), which was a little too “al dente” for my taste, though the meat sauce was very good. I stole a forkful of John Ortega’s Risotto (beef tartare and parmesan), which did not meet expectations. The monthly menu change is also unusual for Moscow, and a boon to encourage experimentation. It also helps build repeat customers who want to try the latest offerings. We understand that Lamberti encourages customer suggestions and input. Unfortunately we did not try Uilliam’s desserts such as Home Style Apple Tart with Ginger and Lemon (350r) or Biscuits Uillliam (100r). Most wines are priced between 1300 and 2700 roubles, mostly French and Italian, with five each of red and white wines by the glass at 350 roubles. We first ordered a bottle of very enjoyable Ceralto Vermentino Bolgheri, a tropical fruity Tuscan white at 2300 roubles, and followed with a solid red Spadafora Monreale Syrah (Sicily) at 1950 roubles. Uilliam’s is open for breakfast and closes “when the last customer leaves”. Reservations are necessary. Fortunately I now have the phone numbers of the PR director and manager.